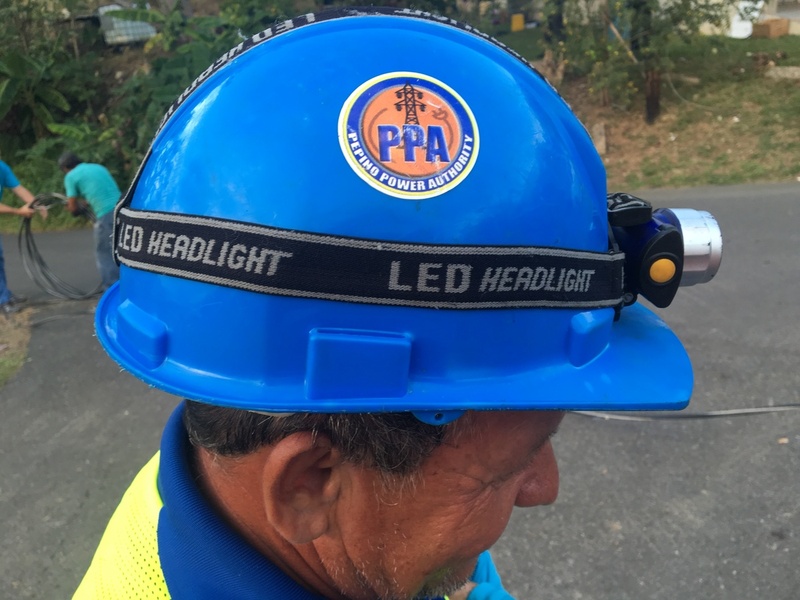 After Months Without Power, A Puerto Rico Town Strings Its Own Lines The Pepino Power Authority of Puerto Rico is a volunteer band of citizens restoring power on their own. The island's electric utility says their work is illegal. Residents don't care. 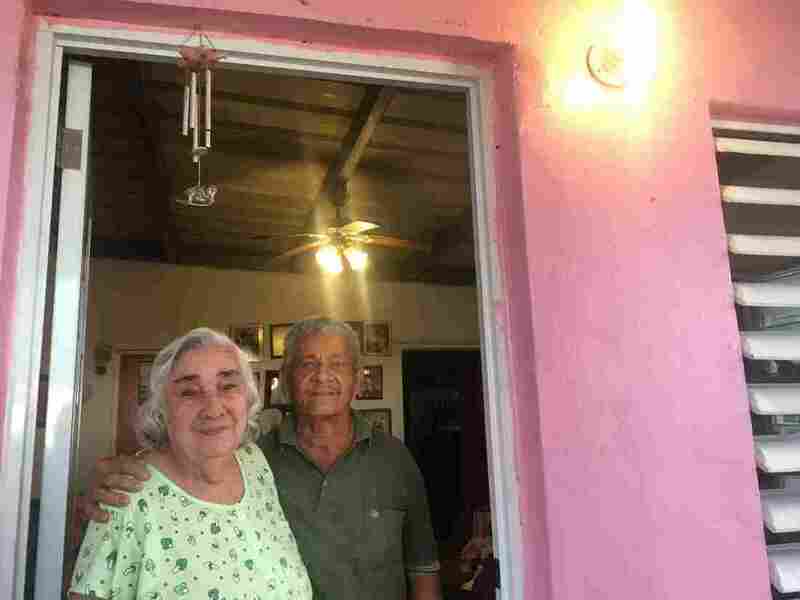 Rosa Cruz and Luis Felipe Colón standing beneath the newly illuminated light on their front porch. The couple had been without electricity for four months. Four months after Hurricane Maria made landfall on Puerto Rico, nearly 40 percent of the island's electricity customers remain without power. Rosa Cruz and her husband, Luis Felipe Colón, both retired, are among them. They've eaten mostly canned food and prayed that Rosa doesn't have an asthma attack, because they can't plug in her nebulizer. Their little house in a rural part of western Puerto Rico sits on a hillside. From their porch, they look down on the town of San Sebastián. "When there was no electricity," Colón says, "it looked really beautiful at sunset." But slowly, the lights are coming back on. Colón says as power is restored to the town below, it's looked even more beautiful. "I tell him, 'look there's light down there,' Rosa says. 'It's getting closer to us!'" This morning, the couple woke up and saw that a crew had re-hoisted the downed utility pole in front of their house. Colón says he literally jumped. "What joy!" he said. "It's our turn!" 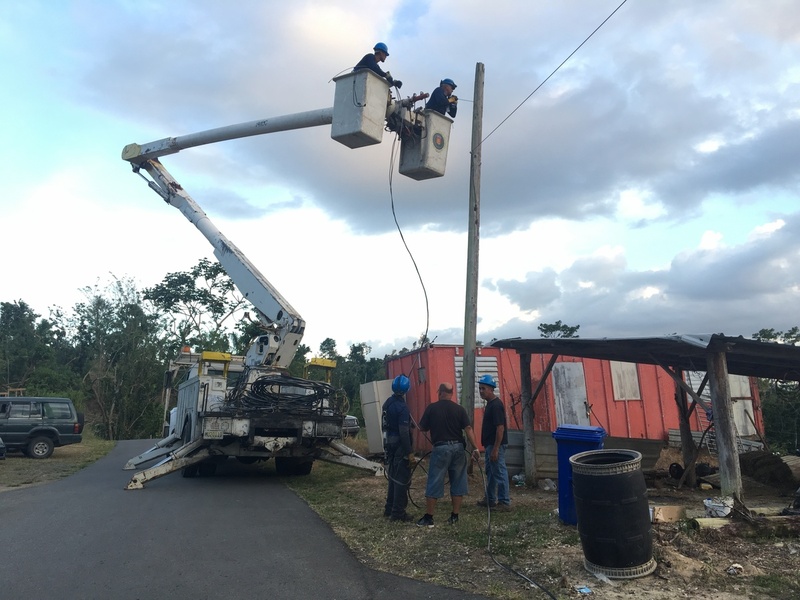 Volunteers with the Pepino Power Authority repair electrical lines on the outskirts of San Sebastián de las Vegas del Pepino, Puerto Rico. The men working out front were not with the Puerto Rico Electric Power Authority, the island's sole utility. Nor with the Army Corps of Engineers. Nor any of the official government crews working to restore electricity to Puerto Rico. They were San Sebastián's police chief - a retired employee of the utility - and a bunch of other men from this municipality, all volunteering to restore power to their town. San Sebastián's city hall is on a picture-perfect plaza with a fountain and a church. In his office, Mayor Javier Jiménez says that back in November, after nearly two months of waiting for the electric utility to start grid repairs in his town, he couldn't take it anymore. "The first thing I did," he says, "was find out which of our employees were electricians." Jiménez said he then put out a call for help for linemen and others who used to work for the utility but were now retired. "And so we started these brigades," he said. The volunteers gave themselves a name: the Pepino Power Authority, the PPA, after the town's full name, San Sebastián de las Vegas del Pepino. They designed a logo and slapped it on their helmets and utility trucks. Official logo of the unofficial Pepino Power Authority. Pepino is Spanish for cucumber. The Pepino Power Authority (pepino is Spanish for cucumber) started fixing electric lines in the center of town, and has been working its way out to the hills. They have met resistance. The The Puerto Rico Electric Power Authority accused Jiménez of circumventing its monopoly. He admits he did. But he objects to another accusation — that what he's doing is unsafe. "One of the first things we did," Jiménez says, "was establish a safety protocol, and we brought in a government inspector." Across Puerto Rico, mayors still waiting for repair crews to arrive in their municipalities have started pressuring the governor to allow them to legally restore their own power. So this week, the legislature announced a bill that would permit cities to hire their own contractors. In San Sebastián, the Pepino Power Authority has already restored service to about 2,500 homes. Joaquín Cruz, a volunteer, says the goal is to restore 100 percent of the town's homes before the end of January. "Yesterday we did between 60 and 80," Cruz says, "and today will be the same." One of those is the little hillside home of Rosa Cruz and Luis Felipe Colón, who've been watching the progress from their porch all day. Every time the workmen of the Pepino Power Authority are ready to turn the power back on to a new home, they get giddy with excitement. Félix Avilés, the police chief turned electrician, races up to the house, switches on the breaker and then flips the switch for the porch light. "Thank you!" Rosa Cruz tells the workers. "We're so blessed!"